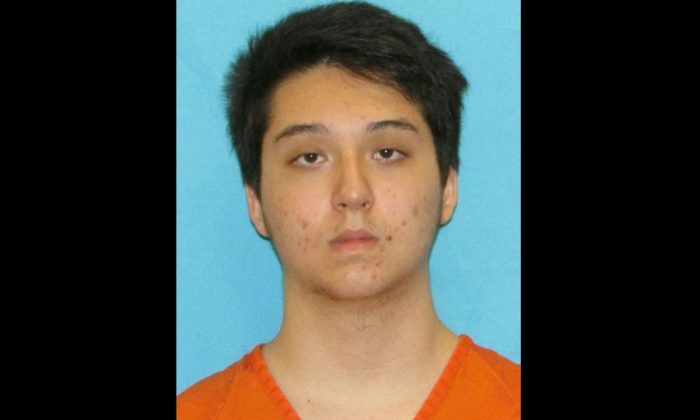 WASHINGTON—A 17-year-old boy in Plano, Texas, has been arrested and charged with plotting a mass shooting inspired by the ISIS at a shopping mall, law enforcement agencies said on Wednesday. The Federal Bureau of Investigation and police said high-school student Matin Azizi-Yarand had planned the attack for mid-May and had sought to recruit others for the shooting. Authorities also said he had drafted a “Message to America” justifying his planned attack. The FBI and local authorities in Collin County, Texas, said that at the time of his arrest, Azizi-Yarand had sent “more than $1,400 to others” to buy weapons and tactical gear. In an affidavit, investigators said Azizi-Yarand began communicating online with an FBI “confidential human source” last December about his desire to travel abroad or to conduct an attack in the United States. He compared himself to other recent “lone wolf” attackers, investigators said. “Look at all the other lone wolves// What training did they have yet they simply killed the kuffar?” Azizi-Yarand told the FBI source, using the Arabic word for “disbelievers,” according to the affidavit. Prosecutors say Azizi-Yarand told the FBI source: “The brothers in Europe the brother in Spain the brother in New York? Had no military training//it’s not about numbers it’s about getting a message across to these taghut countries,” using an Islamic term denoting a focus of worship other than Allah. In other conversations, investigators say, Azizi-Yarand talked about his interest in traveling to Pakistan and then crossing into Afghanistan where he could join ISIS. At another point, he told the FBI source he knew a person in India who had information on jihadi activity in Libya, and who invited Azizi-Yarand to travel there with him. In numerous online conversations, investigators said, Azizi-Yarand shared multiple forms of ISIS propaganda. At another point, he sent the FBI source a document authored by one of the 1999 shooters at Columbine High School in Colorado containing detailed instructions for building pipe bombs. The suspect also discussed various possible targets for a domestic U.S. attack, including a school. Later still, Azizi-Yarand discussed with an undercover FBI employee the possibility of attacking a shopping mall during the Muslim holy month of Ramadan, and at one point sent the FBI employee three pictures of a mall near Plano called the Stonebriar Centre. While the FBI and a Joint Terrorism Task force conducted the investigation leading to Azizi-Yarand’s arrest, so far he has only being charged under Texas state law. Under federal law, the 17-year-old is considered a juvenile, U.S. prosecutors in Texas said. “Federal law limits our ability to certify a juvenile as an adult for prosecution, and in light of that, we determined that state prosecution of the subject will best address the case,” U.S. Attorney Joseph Brown said in a statement. Authorities said if that if Azizi-Yarand is convicted, he would face up to life in prison for soliciting others to participate in his planned attack, and up to 10 years in prison for making a terroristic threat. Azizi-Yarand is in custody and bond has been set at $3 million.